Can I Please Have a Napkin? Sometime it’s the little things that get to you. 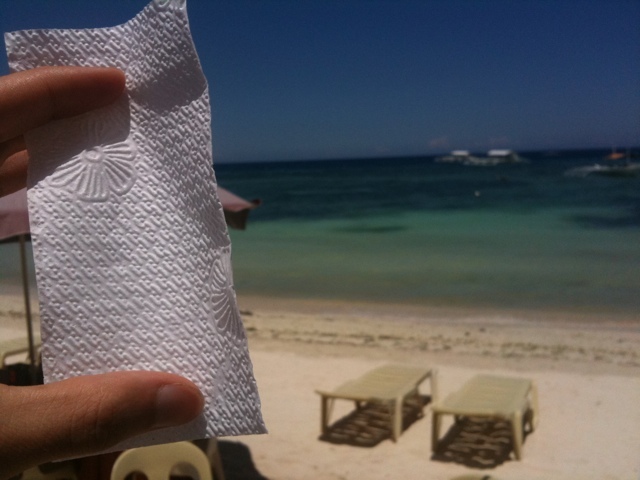 On our travels, we’ve discovered that napkin availability seems to be very different from back home. This week I’ve had a runny nose and the differences have made me long for the American napkin experience. It began in Japan where they have a different approach to napkin availability. They don’t have them. Obviously, we’re extrapolating from a very limited experience, but in Japan napkins weren’t on your table, nor on the condiment counter next to straws and they didn’t even give them to you with your meal. What’s even more perplexing is that from our perspective, it didn’t seem like the locals even needed them. We never saw anyone use a napkin that wasn’t foreign. Japanese food isn’t very messy for the most part, so it’s almost possible to believe except that people accidentally spill food. Right? I never thought that was a choice. Now, I could ask for a napkin and usually one or even two might be doled out, but it felt like I was asking to play with their pet platypus every time. Flash-forward to the five countries we’ve visited in Southeast Asia so far, the napkin experience is only slightly better. They have what I like to call the One Napkin Policy. They oh so generously give each customer one napkin with each order. They still have no concept of the self-serve napkin in most places, so you won’t find them at your table or on the condiment counter. Our time traveling has also made me appreciate that all napkins are not created equal. I’m sure most of you are envisioning the standard napkin in the states: about the size of a paperback book, 4-ply and water absorbent. None of those napkin qualities exist here. The places we’ve visited pretty consistently offer the iPhone sized, 1-2 ply and water repellent variety (above picture). Obviously size and ply matter when you’re only getting one. But the water repellent napkin makes me think I don’t understand the very purpose of a napkin. I thought absorption was fundamental to the design. Don’t get me wrong, napkin consumption in the States is out of control. But going from a self-service buffet of napkins to an authoritarian one napkin policy has been a transition — especially with my runny nose. I feel it’s possible this post was inspired by too much Sudafed. use their arms for many purposes.